Although fluorescence measurements are a fundamental tool to characterize biochemical circuits, suitable measurement instruments are usually very expensive and therefore not available for all iGEM teams. We therefore constructed a portable low-cost fluorescence detector that can be assembled for less than 15$ and can measure time traces with the sensitivity similar to a commercial plate reader. The assembly of the detector only requires standard electronic components and a 3D printer. We provide equations to calibrate the data from the detector including a complete consideration of the propagation of uncertainties and wrote program code to automatize data analysis. As a first proof of principle we measured a time trace of Cas13a digesting RNaseAlert with our detector. RNaseAlert is a commercially available fluorescent beacon consisting of a reporter fluorophore and a quencher connected by an RNA-linker, bringing them in close proximity. While in the intact state, the fluorophore is quenched, cleavage of the RNA-linker separates the two labels and restores fluorescence. For comparison, we also measured a time trace of the highly active RNaseA digesting RNaseAlert and a time trace of a sample containing only RNaseAlert. The time traces measured with our detector are shown in the figure below. Time lapse measurement of Cas13a digesting RNaseAlert on paper using our detector. The positive control contains RNaseA and RNaseAlert. The negative control contains only RNaseAlert. Data points are connected with lines for the convenience of the eye. Error bars represent the measurement uncertainties of the detector. 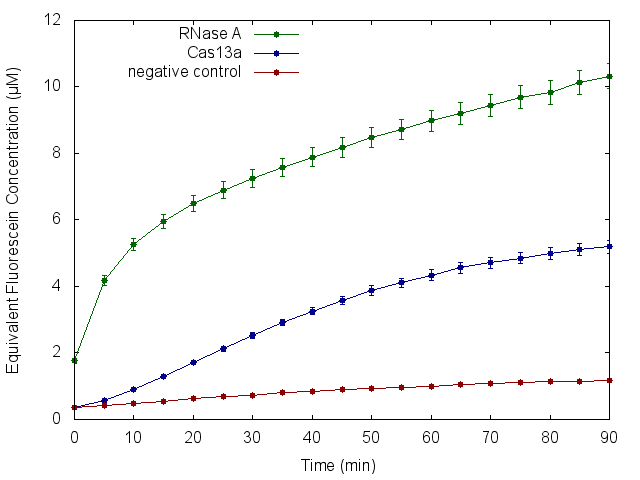 The data show typical curves of enzyme kinetics. It can be seen that RNaseA is more active than Cas13a. This shows that our detector is in fact able to quantitatively measure different levels of enzyme activity and can therefore be used to characterize BioBricks. We classified our detector by creating the cost vs. sensitivity diagram in the figure below. We compared commercial detectors, detectors from other iGEM teams and low-cost detectors from publications to our detector. Cost vs. sensitivity diagram of several fluorescence detectors. We compared commercially available detectors (orange dots), low-cost detectors from publications1-5 (green dots) and detectors from other iGEM teams (blue dots) to our fluorescence detector (red dot). A detailed description, including derivations of all equations and all necessary information to rebuild our detector can be found on our hardware page. Here we provide a brief description of the functionality of our detector and a summary of all equations needed to process and analyse data with our detector. The conceptional design of our fluorescence detector is illustrated in the figure below. Light from a blue LED is filtered by a blue filter foil and excites fluorophores on a filter paper. The excitation light is blocked by an orange filter foil while the emission light from the fluorophores passes through the orange filter foil and illuminates a light dependent resistor (LDR). The LDR changes its resistance RLDR corresponding to the intensity of the fluorescence light. Finally an Arduino Nano measures the resistance via a voltage divider and calculates the fluorophore concentration. Schematic drawing of our fluorescence detector. Light rays with a certain wavelength are displayed as arrows with corresponding color. 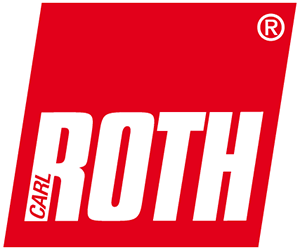 The most important electronic components are displayed as their circuit symbol. The calibration is shown in the figure below. 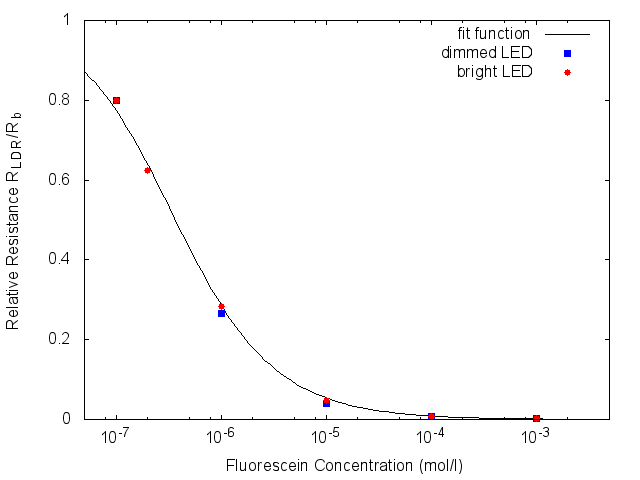 Normalized resistances RLDR/Rb vs. fluorescein concentration c and corresponding fit function. where σRb is the relative uncertainty of Rb and σk is the relative uncertainty of k given by the result from the fit of k.
The detailed documentation and our framework of equations provide an excellent template for future iGEM teams to rebuild and use our detector for their applications. The compact design of the detector makes it an excellent alternative to a commercial fluorescence detectors for in field applications. Wu, Jing, et al. "An economical fluorescence detector for lab-on-a-chip devices with a light emitting photodiode and a low-cost avalanche photodiode." Analyst 137.2 (2012): 519-525. Walczak, Rafał, and Krzysztof Adamski. "Inkjet 3D printing of microfluidic structures—on the selection of the printer towards printing your own microfluidic chips." Journal of Micromechanics and Microengineering 25.8 (2015): 085013. Yang, Feng-Bo, et al. "A low-cost light-emitting diode induced fluorescence detector for capillary electrophoresis based on an orthogonal optical arrangement." Talanta 78.3 (2009): 1155-1158.0039-9140, https://doi.org/10.1016/j.talanta.2009.01.033. Novak, Lukas, et al. "An integrated fluorescence detection system for lab-on-a-chip applications." Lab on a Chip 7.1 (2007): 27-29. Pais, Andrea, et al. "High-sensitivity, disposable lab-on-a-chip with thin-film organic electronics for fluorescence detection." Lab on a Chip 8.5 (2008): 794-800.